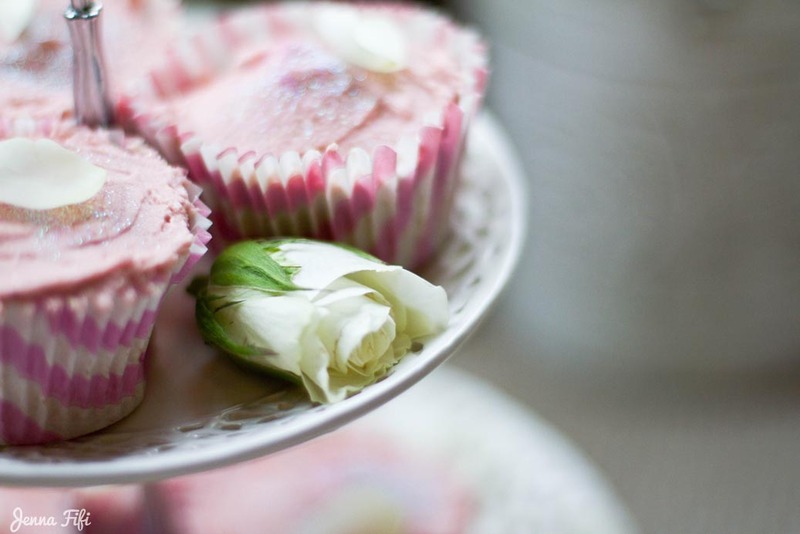 My favourite easy recipe to create chic rose petal cupcakes! Following an unforgettable weekend in London treating my Mum to endless surprises, we arrived back home to sleepy Somerset just in time for her birthday. 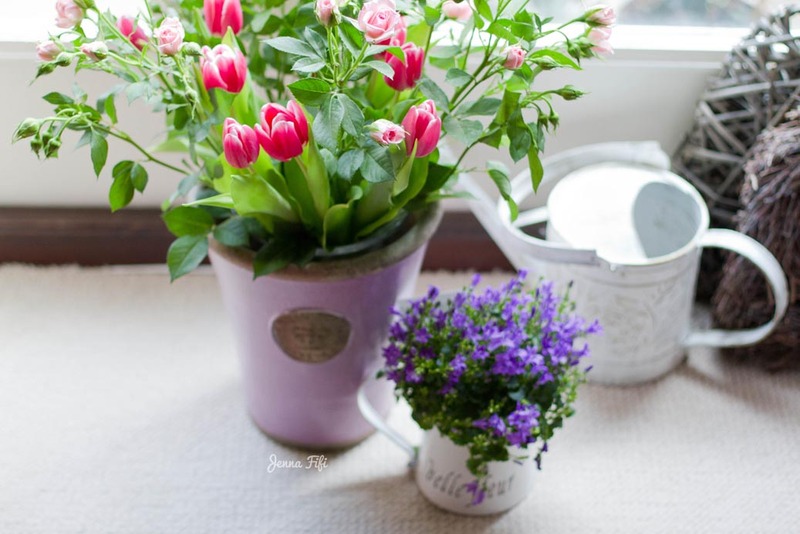 Even I thought I was thoroughly ‘gifted out’ until shopping for flowers reminded me of one present that is always set to go down well – cupcakes. 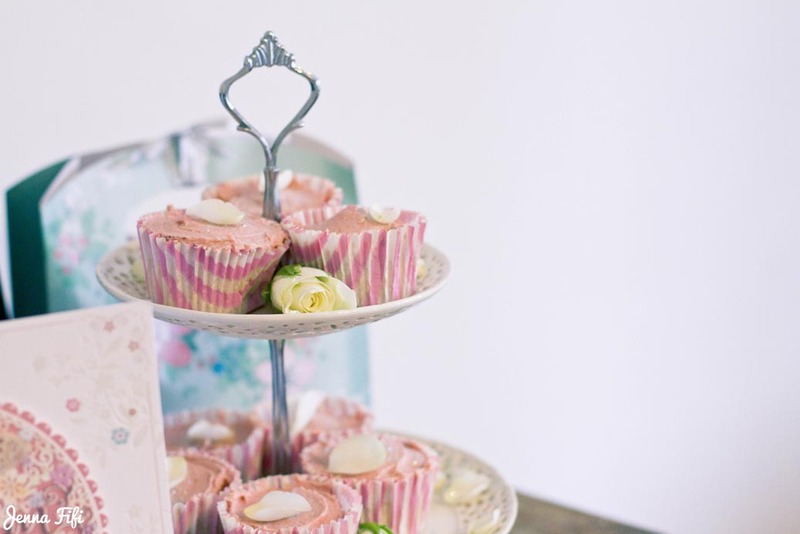 Simple, thoughtful and home made – everyone loves cupcakes! 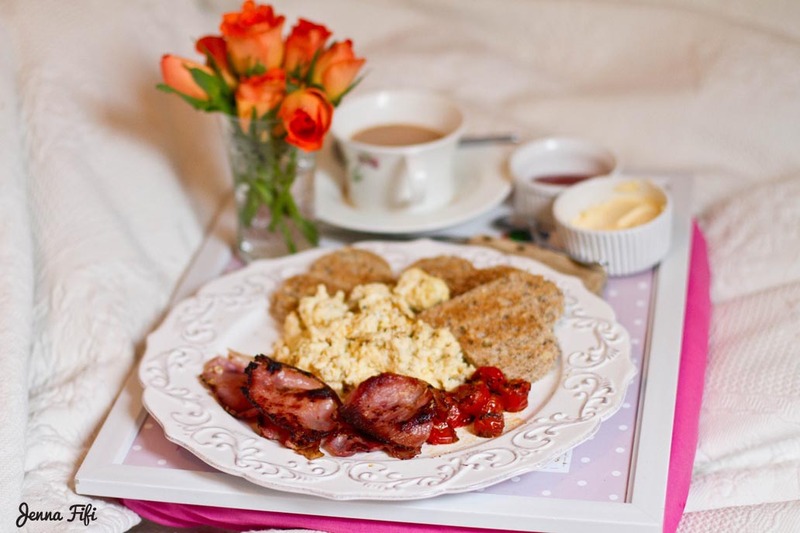 I presented them to my mum with her cooked birthday breakfast in bed (is there anything more wonderful to wake upto? 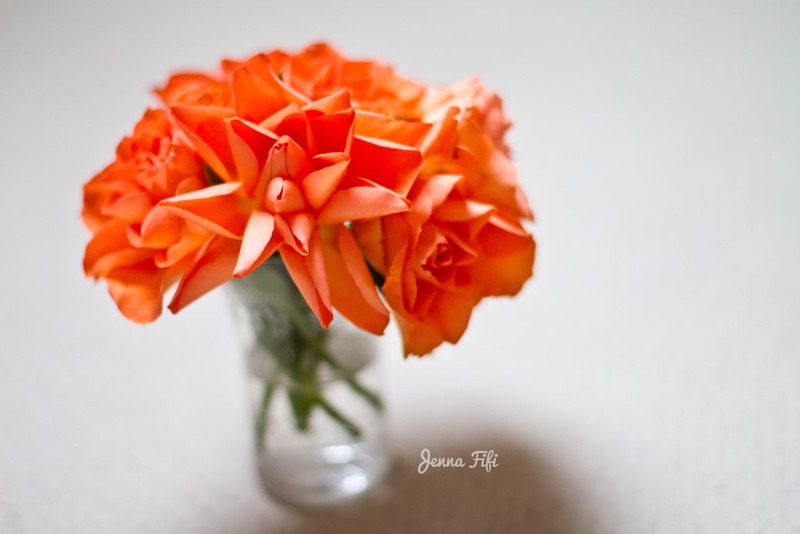 ), little slices of heart shaped toast, fresh roses and a big hug! She was one happy Mummy! As somone who enjoys baking delicious treats on a weekley basis (and eating the majority of it) I’m pretty clued up with my cake recipes. 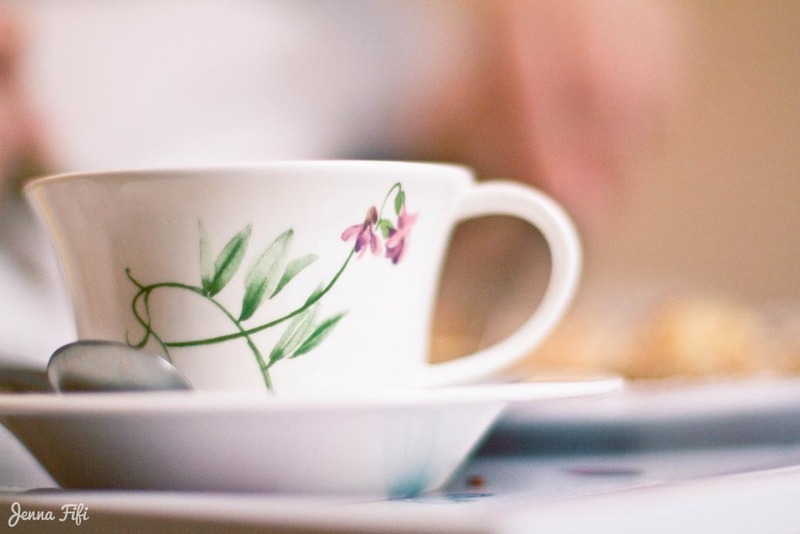 In the past two years the baking industry has evolved like the tips of whisked egg whites, with The Great British Bake Off encouraging us Brits to dig out our aprons and whisks, and get baking. I started baking long before this, but unlike the sales of Dr Oetker, my cakes didn’t rise. At first I was a terrible baker, and opening the oven door was often met with a feeling of disappointment and confusion. I spent more time working out what I did wrong, then eating the cake, if supposing it was edible of course. I once recall putting in the wrong flour! So, what was it that turned my cake fate around? Organisation, precision and passion. I did my homework, read up on the science behind baking, drooled over pinterest and quadruple checked what flour I was using. Years later I’m now always the one ‘who brings dessert’ and thanks to more experience and knowledge baking is a relaxing and enjoyable way for me to unwind, and eat a little too much! I’ve tried lots of variations on the cupcake recipe, but I have always come back to the 4-4-4-2 recipe – the most basic recipe there is. It never fails, it’s easy to do and budget friendly. Even when I have got plenty of time, I still prefer this recipe because I genuinely think the cakes always taste delicious! For this recipe I doubled the ingredients (8-8-8-4) so I could fill up muffin cases instead, which made about 12. 1. Make sure your eggs and butter are at room temperature before you start mixing them as they will blend together much more easily. 3. Be gentle with whisking and try to stick to a low to medium speed so you keep as many air bubbles as possible, which will eventually expand in the oven causing your cakes to rise. 4. Don’t over whisk. Once its all blended, the whisk has done its job. 4. Add the eggs one at a time, along with the vanilla extract and whisk until the mixture is all combined and smooth. 7. When they are fully baked leave them to cool on a cooling rack before icing them. Whilst the addition of rose petals and edible glitter may look impressive, its actually the easiest way to decorate a cake and still make it look too good to eat. 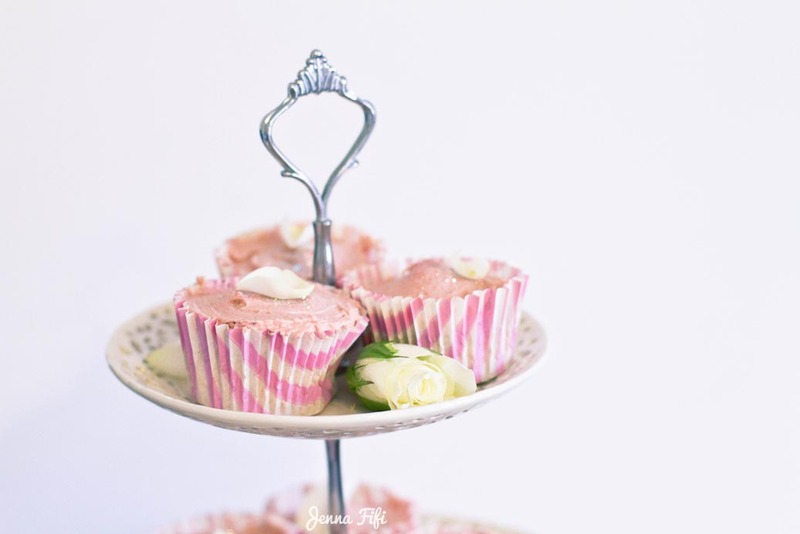 I made up some buttercream icing and coloured it with Sugarflair colouring paste in dusky pink, then sprinkled on petals and glitter – so easy! 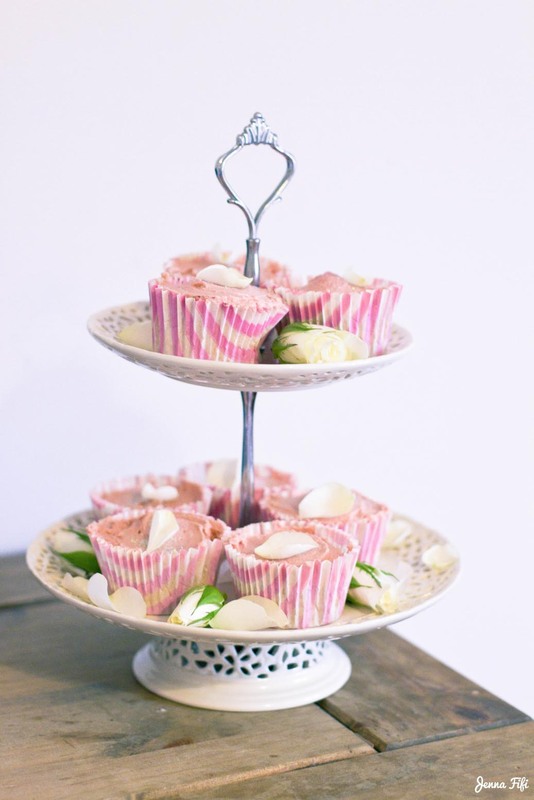 Candy cane muffin cases – These are from Waitrose and the pack comes with two other styles which are equally as cute! Sugarflair colouring paste – When colouring icing these are much better than liquid food colouring, whilst they are a little more expensive they last for ages and you only need a little bit. 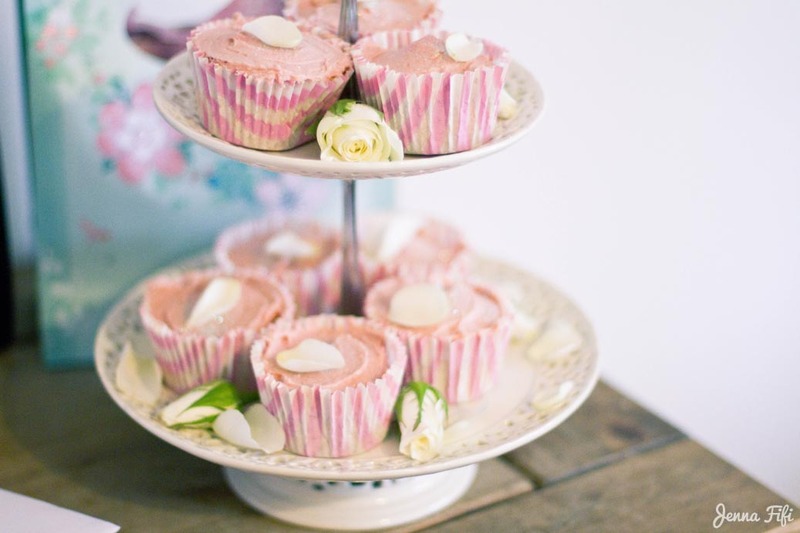 To get this pink I barely grazed the edge of a knife into the paste and then dipped it into the icing – you really don’t need much, so always build up your colour gradually. You can buy this in lots of colours from specialist craft shops or online here. 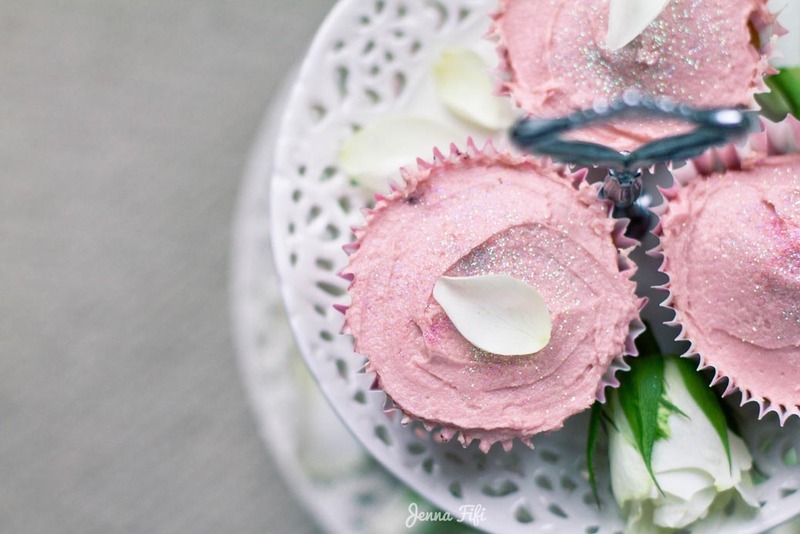 Edible glitter – This stuff if just brilliant! But make sure its edible! Pots that say ‘non toxic’ doesn’t mean its fit for consumption – its catching alot of people out! Check the labels, stock up and you’ll never be out of an easy, quick way to make any bake look magical! I go a bit sprinkle happy with this stuff! 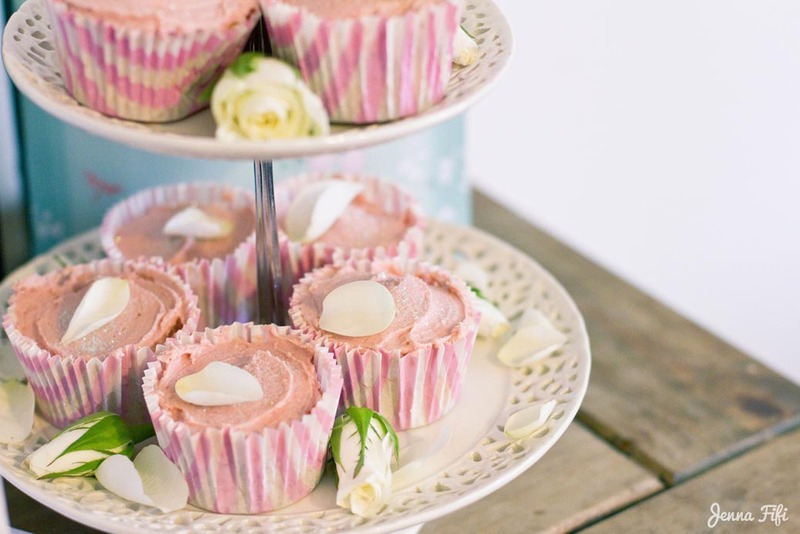 Rose petals – If you want to use flowers in your baking, be sure to only use organic or home grown flowers so as to ensure they haven’t been sprayed with any chemicals. Roses are definitely my prefered flower to drape over deliciousness, but whole pansies also look beautiful too. Colouring paste – I used Sugarflair paste colour in dusky pink. 1. Beat the butter in a bowl until very soft. 3. Add the rest of the icing sugar and mix until it reaches the desired consistency. 4. Using the tip of a knife, add in a teeny tiny drop of colouring paste. 7. Apply to cooled cupcakes using a frosting spatula. If you haven’t got that I’ve used butter knives before and find them just as easy to work with. 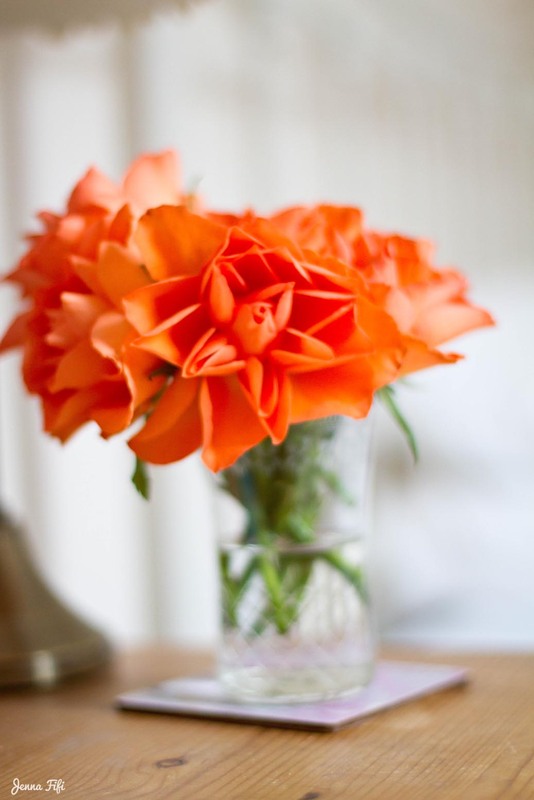 Simple and yet so pretty! Thanks for reading everyone! Wishing you all a sunny weekend filled with cupcakes! These pictures are amazing! Thank you for the receipt I 'll definately try to cook these adorable cupcakes! oh my, it does look so delicious, yum! The cupcakes look gorgeous! Lovely pictures too! These turned out so beautifully! Your cupcakes actually look professionally made.